Improv Everywhere, is the group that brought you such stunts as a bunch of people freezing in place at Grand Central Station, creating a time loop in a Starbucks, and my personal favorite: getting 80 folks to dress up in Best Buy employee outfits and swarm a Best Buy. 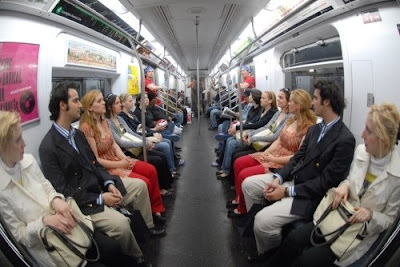 Their most recent mission was getting identically dressed identical twins to fill a subway car, symmetrically. I knew twins were good for something. 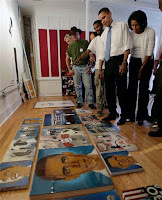 Barackyogenesis (buh-RAK-ee-oh-JEN-uh-sis) n. An attempt to explain why there were more Barackyons than anti-Barackyons in the Democratic Party, a condition necessary for the formation of heavier election matters. Example: There must be some initial perturbation to explain the Barackyogenesis problem. Many political scientists have suggested that an imbalanced density of subatomic particles known as "charm quarks" in the candidates led to the dominance of Barackyons over anti-Barackyons. 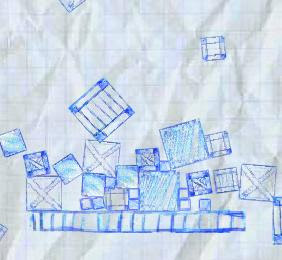 For some reason, the genre of physics flash games resembling crayon sketches has exploded recently. Meaning that there are now at least two. I will keep you posted of others as I become aware of them. This is a bit simpler than "CPD" you just stack little boxes on top of something precarious. It is also extremely difficult. I can't tell whether that means there is more strategy or less.